At the National Committee on Uniform Traffic Control Devices Committee Joint Signals/Bicycles meeting last night we made progress on the provision of bicycle signals in the Manual. The FHWA staff started off with a discussion of the direction they have been given by Ray LaHood, who implements policy through the FHWA Administrator Victor Mendez. The report we got from the staff was that that "75%" of the NACTO Urban Bikeway Design Guide would be implemented in the next Manual. The FHWA contact seemed to suggest that it would happen even if the National Committee did not support the changes which seems to be a big change to what the National Committee is used to. One of the elements that FHWA staff and the Signals folks raised at the end of the dialogue was the problems as they saw them with the combination of stop signs and the pedestrian hybrid beacon side street display. 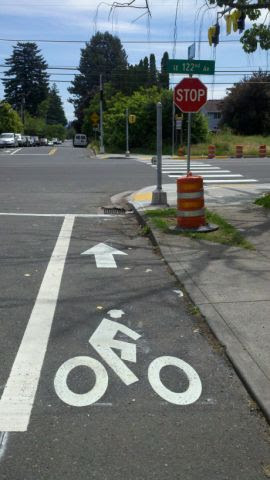 They believe that the combination of a stop sign and a bicycle traffic signal is in direct conflict and therefore should be strictly prohibited in the MUTCD (shall statement). I highlighted that we have not had an operational problem with this configuration at our two locations and we're planning to build two more (SE 19th & Tacoma and E 53rd & Burnside). This is similar to the complaint with the Half Signals. In the streamlining effort of the Manual, it was pointed out that Half Signals are no longer strictly prohibited. The intent is that the Pedestrian Hybrid Beacon would specifically prohibit bicycle signals being part of the installation. There was also specific feedback that Portland received with how the display was using flashing red and not to use the wig wag operation (wig wag is reserved for railroad signals in all other cases). There was also the argument that beacons should not be at intersections. The fundamental research on the topic was focused in Tucson where they have deployed more than 80 beacons and they are mostly at intersections. There has been some conversation about eliminating that should not statement based on feedback from Tucson and other communities. Portland Signals staff had concerns related to the pedestrian countdown timer and the safety of a person (running or cycling) arriving during the flashing don't walk countdown. There are some that are not interested in the argument as engineers often think of these crossing events as singular in nature (limited walking and cycling occurs in their communities? ), so the late arriving person should just wait for the next opportunity and not cross on the Flashing Don't Walk. The other element for bicycle signals that FHWA wanted the National Committee and the Task Force to consider was the inclusion of warrants. The warrants used in the California MUTCD are captured below. The entire CA MUTCD can be found here. The one problem I see with the warrants (this is likely why there isn't a proliferation of bicycle signals in CA) is the need for >50 bicycles at a particular location. If there's no crossing opportunity now, it will be likely to not have 50 crossings. If the anticipation or projection of bicycle volumes is allowed than this isn't as significant of a barrier. I confirmed with FHWA staff that the City of Portland's implementation of a bicycle signal at a pedestrian hybrid beacon is still under experimental review, if this prohibition comes to pass, the City would be notified. Did any discussions come up at the NUTCD regarding bike conflicts during the wig/wag phase at hybrid beacons? Some of the installations on multi use paths in the Phoenix area have had conflicts. Cyclists approaching on the path see the flashing don't walk, and think that because they're going faster than peds, they have time to clear. Drivers, seeing the wig wag and a clear crosswalk, are proceeding. I raised this issue. Most communities have a single bicycle crossing, so they don't see the potential for conflict. In fact, the City doesn't use a wig wag (that's typically reserved for heavy rail crossings) and we leave the solid red operational until after the bike would have had a chance to clear the intersection. (A) Bikes cannot be served by the general vehicular signals. E.g., when there is a 2-way sidepath, there may not be a signal head on the same side of the street as the path for one of the path's directions. Or on a one-way sidepath adjacent to a right-turn lane controlled by its own green / red arrow. (B) the time that the traffic signal program desires to give to bicycles is different from the time that is given to the concurrent vehicular movement. For example, for a leading bike interval, or for a bike phase that is protected from a right turn phase, or for a bike-and-ped-only phase. Hi Peter, you allude to the current (but criticized) guidance in 2009 MUTCD 4F.02 that a PHB "should be installed at least 100 feet from side streets or driveways that are controlled by STOP or YIELD signs". At its June 2011 meeting the NCUTCD approved a recommendation to FHWA to remove this sentence in the next edition, and to add a new Standard statement that "If a pedestrian hybrid beacon is installed at or immediately adjacent to an intersection with a side road, vehicular traffic on the side road shall be controlled by STOP signs."